The Great River Race, “the one they all want to win”, has firmly established itself in the sporting calendar to such an extent that experienced crews describe it as a classic event. With its intriguing mix of colour, spectacle, intense competition and casual fun, it combines all the ingredients that made London’s ‘other’ marathon such a success; but with the addition of dozens of great photo opportunities as the race progresses from the striking Docklands skyline at the start, through central London until it reaches its semi-rural Surrey conclusion. The first Great River race in 1988 race consisted of 72 entrants in 20 boats ranging from hardy rowers to scouts from many parts of the globe. Now the race boasts well over 300 boats carrying approx. 2,400 crew; The Great River Race has become the biggest and most prestigious event of its kind in Europe. The anticipation, excitement and nerves were at their highest when 2 highly motivated teams made their way from their cosy South West London homes to London Docklands early on this historic early Saturday morning, packed with just the bare essentials – flapjack, water and those quite revolting energy packs – the mood was sombre and none of the crew knew really what to expect apart from we all knew it was about to be 21 gruelling miles from London Docklands to Richmond. Both teams had been put together organised and managed by the fearless, enthusiastic Martin Beaumont, whose energy, commitment and generosity one can only stand back and admire. 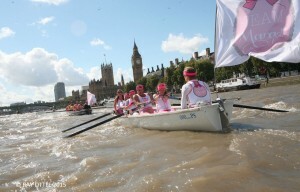 Yes we had done a little bit of training and some of us had rowed together on the Thames but we were far from experts. There were 2 races! 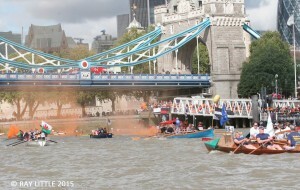 The official Great River race and the other one containing a 24ft Lord Beefington Celtic long boat skippered by that Martin fellow and off course the amazing 000….PS skippered by the well-known around the world oarsperson, Emma! 000….PS crew smugly skipped down a pontoon. When I say skipped I mean skipped – we were (not quite sure why!) all wearing pinky leggings things, pink sweat bands and pink everything. We did look a sight (feet in dry pristine condition) to mount our chariot and with a bit of messing about the oars were in place, the TEAM MARGOT flags were up and we were ready to go. 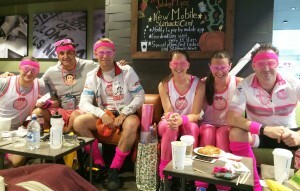 Lord Beefington crew – boys dressed in these ghastly muscle man tee shirts and girls in bay watch attire stomped through thick mud and after much faffing were on their way again, TEAM MARGOT flag flying. The scene of the first half of the race was just amazing. Picture for a second 200 boats all shapes and sizes with the back drop of the city of London, Tower Bridge, the Walky Talky, the Shard and Houses of Parliament. Sadly the only thing I was looking at was the back of that boat Lord Beefington. How very dare they be in front of us? Surely, we were much stronger with much more talent than them. Our cox at the time threw us into another gear and with a surge of power we overtook them going through London Bridge, I think. This was it! Good bye Lord Beefington, no prizes for second place, losers! Our efforts were short lived, the whites of the eyes of Lord Beefington crew had turned red, the stroke rate went up and for several minutes we rowed side by side for what seemed like an eternity – we even locked oars at one point. Knowing how upset they would be if we did not let Lord Beefington go ahead, we off course purposely slowed down and watched them disappear into the distance! 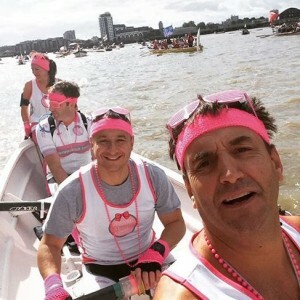 By Putney we were all feeling a bit weary to say the least but the support from the local crowd between Putney Bridge and Chiswick Bridge really spurred us on together with the amazing support from each member of our crew spurring the other on to succeed – unbelievable! We had been going for about 2 and a half hours by Chiswick bridge so there was only 30 min to go. I think we all had to dig very deep. The crowd on the banks were cheering and spurring us with every single person in the boat willing each other to continue – hands hurting, back aching with legs and arms like jelly, it was properly emotional and hard. The finish gun was a massive sigh of relief, a few tears shed and lots of admiration for the others who had worked so hard to get to the finishing line. The tank was empty all round. Ok, Lord Beefington beat us by about 10 or so minutes but it doesn’t matter, there is always next year (I think!). “It was a joy to be there today and watch the emotions beautifully shared with warm embraces and looks exchanged that needed no words. I watched, and I hope captured an incredible team of strong bodies and most of all strong hearts”. In fact, from next week on Lord Beefington become our allies as Martin is training us to take part in a “little race” Bank Holiday May 2016 called The Celtic Challenge. It is the world’s longest true rowing race where teams race from Arklow, a town in County Wicklow Ireland, to Aberystwyth, on the Welsh coast. A distance of about 90 nautical miles where each boat is about 24 feet (8m) long, has 4 fixed seats and one cox. By late April / May next year, we are all hoping to be experts, off course we will be! The driving factor is not only about doing something a bit different, challenging and get the badge, there is a much more worthy reason behind and this is the real reason we are all together, it involves a charity very close to all our hearts, TEAM MARGOT. A crucial member of the team, Yaser Martini and his wife Victoria Martini, lost their daughter to a rare blood cancer. In 2013, 14-month-old Margot Martini was diagnosed with blood cancer and required a bone marrow transplant (also known as a stem cell transplant) to stand the best chance of survival. Family and friends came together as TEAM MARGOT to raise awareness of Margot’s plight and others desperately seeking a blood stem cell donor match. Margot eventually found a “suitable” donor match and received her bone marrow transplant in February 2014. Unfortunately, Margot’s Leukaemia was extremely aggressive. She relapsed during that summer and passed away, aged 2 years and 2 months, on the 27 October 2014. TEAM MARGOT’s efforts to date have resulted in tens of thousands of people registering as potential stem cell donors. Statistically, this means that during the next ten years, more than 500 people will now have the chance of a potentially life saving bone marrow / stem cell transplant. ANYONE can help just by registering themselves and telling as many people as possible to do the same. It takes minutes and it costs nothing. The more registered people there are, the more likely that lives can be saved.